Bring your business cards, mix & mingle with fellow members. Develop leads and contacts. Contact the Chamber Office at 908-766-6755 for location. Bring Your Business Cards, Make New & Solid Leads. Enjoy Some Libations As We Share The Irish! 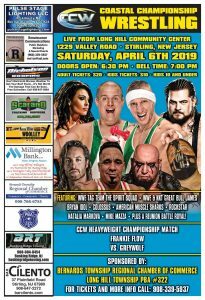 (STIRLING, NJ) Pro Wrestling Coming To Stirling, NJ, This Coming Saturday Night, April 6th!! Wrestlers are already beginning to arrive in New Jersey for our Huge Show this Saturday Night at the Long Hill Community Center. Don't miss the Heavyweight Title Match, Women's Championship Triple Threat, a 20 Man Battle Royal, former WWE Tag Team Champs The Spirit Squad & WWE/NXT Superstar Bull James all in action! "This is a fantastic evening of family, fun-filled excitement," comments co-chairs, Gary Bauer, Long Hill PBA & Al LiCata, Bernards Twp. Regional Chamber of Commerce. Get Your Tickets Today By Calling 908-339-5937. Adults $20 & Kids only $10. Family friendly show. Hosted by the Bernards Township Regional Chamber of Commerce & the Long Hill PBA. Chamber Members, Bring your business cards and greet fellow members with the goal to make solid leads and develop contacts. Denning Dermatology is our host for the event. Be sure to let us know your attending so Denning's can properly prepare. RSVP the Chamber at 908-339-5937. Not. Chamber Member? Consider membership in our growing Regional Chamber of Commerce. Call us at 908-766-6755. Bring Your Business Cards, Make New & Solid Leads. Learn from PD on business crime updates and crime prevention. Hosted by Chamber Member Keller Williams Towne Square Realty. Contact the Chamber Office at 908-766-6755 for additional information. Bring Your Business Cards, Make New & Solid Leads. Members will enjoy BBQ & beverages. Hosted by Chamber Member Tarheel Total Pet Care.